intimations of a cross and is warmly welcoming. You think we will never get Freddy out of his car, that his tortuous commute will never end, and that is what Freddy thinks every morning. Early mornings, it seems so smooth as if people are staying away from the highway so Freddy can have a smooth start to the day, but even then, sometimes he worries that the commute will never end. Freddy thinks he knows eternity. Eternity is worse on the way home. Coming down 12th, Freddy will look at his car clock, two blocks before he gets to his terminus of layers and layers of concrete slab ready to collapse, and he will be amazed every time. It’s usually 20 minutes or 21 minutes. Such a short amount of time, but Freddy knows it is eternity. The bottom of the earth crawls around in his feet. The pressure on the braking makes him nervous during a majority of his descent to the bottom of the earth, and he wonders what is grinding away when he feels some sort of diminishing screeching of fur balls with ice of the metals. Today, Freddy realizes that the world and all of the timeline that he perceives is a giant piece of music. He is stuck with defining his existence – Is he sporadic parts of the score, notes here and there with embellishing instructions on how he should be played, or is he an instrument, dutifully playing all of those notes, to the best of his ability, never perfectly, but good music cannot be perfect. Being a portion of the notes of this massive, perhaps bombastic creation has a certain fatalistic feel to it. Freddy has no elective options in the mess. He is done by one instrument and then done by another, and the fascination is the resulting harmony of how he fits, perhaps sweetly, but likely not so sweetly because this, after all, is a bombastic creation. The rhythm is directed from the unknowable, the unseen source, and so Freddy bounces from this to that, spastic, manically, as if the events have the dotted, staccato markings, where no understanding is possible because the stay is so short, driven by a sense of time that is brutally harsh and frankly unfair, those notes that are heard in complex harmonies that are merely meant to aggravate in order for the listener to strongly desire that the music move forward in some perdurable fashion. However this progresses, we know that even the indefatigable requires rest. This piece will never end. It seems to be played over and over again with different versions, contrasting like Toscanini vs. von Karajan, but it is sedulous and unending with trillions of layers of musicians from before, like Freddy’s Mother who is demonstrating how one put one’s entire back and shoulders into the most ecstatic chords that Brahms created for the piano, where in certain corners there are pianists who are tireless in their practice of certain phrases from Scarlatti, playing two bars of terribly feisty chords in higher octaves, meant to create tension briefly, being played over and over while a child acts out a sleep in a bed with soaked sheets from a feverish flu, longing to die quickly, but also there are those musicians from the future mixing in with all of these layers. When it hits those resting spots, Freddy is landed as if in a pot of boiling chicken gizzards squirming and wrapping themselves around him, informing him that when his place is to serve as this note, as this part of the infinite piece, there will be no escape, that perhaps he will be boiling being choked by gizzards forevermore, the languid low D from the ending of a Shostakovich symphony, whereby when Shostakovich seemed interminable, he wasn’t, but Freddy is stuck in the undefinable permanent bottom cycle of depression, one that should allow for compassionate suicide, but Freddy is only this note or that note and here he has landed and is not allowed to die like a natural D would do in artful music – This is the music of life. This is how life is really a monstrous musical score devised by some deviant more hellish than Schoenberg. I wear my headphones. They help me grind through insanely boring work. People think I’m rude and I use the headphones because I don’t like people. Most times, I hope they’re wrong. When my headphones are off, all that I hear is insane, meaningless chatter – Meaningless because there is so much of it that it no longer sounds like English. I can only hear rising and lowering tones and then slow are then more rapid rhythms. Usually it is active recaps of last night’s network TV. I love random chance music, but I’d rather listen to my favorite composers instead. Sometimes I listen to Insane Clown Posse, and I hope I don’t sing along too loudly because those guys say a lot of bad words. I like my Pearl Jam or some Soundgarden. I like Bach. 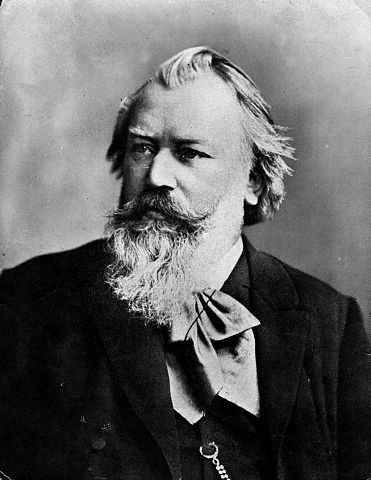 I love Brahms but when I listen to Brahms I air-conduct too wildly.